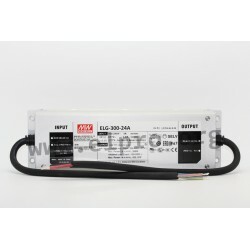 Power supplies in a metal case (IP67) suitable for indoor and outdoor LED lighting applications. These devices have constant current and voltage, adjustable through a built-in potentiometer and therefore ensuring a long LED lifetime. Furthermore they are in compliance with the safety standards EN61347-1, EN61347-2-13 and the EMC standards EN55015, EN6100-3-2 Class C, EN61000-3-3, EN61547. These independent power supplies have a wide input voltage range and a built-in PFC function. They meet the 6kV surge immunitiy level, are SELV compliant and protected against short circuit, overcurrent, overtemperature, overvoltage and overload through constant current limiting (auto recovery). 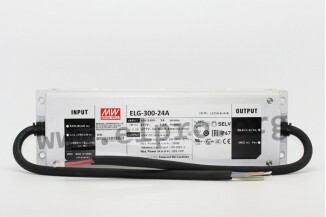 We offer the type ELG-300-24A.